At my house, today's the day when the rush of Christmas preparation stops and the simple pleasure of Christmas tradition begins: my annual cookie swap and brunch. At the table, out come the wintry hearts 'n' pines plates and my mother's 1960s-era red glasses. From the kitchen emerge the foods, mostly old but the occasional new, that celebrate family and faith, faith in family, family in faith. The picture's from the pre-party table; later it was littered with champagne glasses and cookie crumbs, the room filled with talk and laughter. 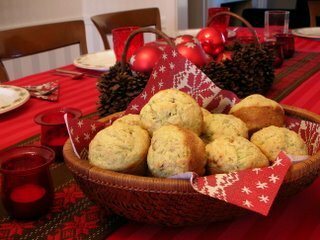 The muffins were part of a simple brunch, just eggs and bacon and a fruit salad. Even back in 1984, the last time these muffins were made, I was already keeping notes. "Delicate flavor" and "froze well", I wrote. And while bookmarked and word-processed recipes are 21st-century convenient, already I mourn the absence of the food notes that don't get written, like these, "big hit at 2005 cookie swap, so were Adanna and Matthew's 'conversation questions', lots of laughs and reminiscing" and "zest from 1 lemon not enough, best with jam". I wonder: how do we attach food-and-friend memories to recipes in an electronic world? how do we 'browse' those memories in the way we flip through a recipe box? Preheat oven to 400F. Whisk the eggs, then whisk in the milk, oil and zucchini. Incorporate the flour mixture into the wet mixture until barely mixed. Stir in the pecans and raisins. Fill greased muffins pans 2/3 full with batter and bake for 20 - 25 minutes for standard-size muffins (and according to the recipe, 15 - 25 minutes for 36 mini muffins or 20 - 30 minutes for 6 - 8 giant muffins or 30 - 35 minutes for a nine-inch square coffee cake). Thanks for stopping by and reporting from the baking of "Cousins"! Glad you liked them!